Suzuki GSX-R600 is a class-leading sportbike worthy of its race-winning GSX-R heritage. Whether you're carving through your favorite canyon or dominating the racetrack, it offers unparalleled performance. A compact, powerful four-cylinder engine demonstrates the advanced race-proven technology of the GSX-R line when you hit the throttle and push it to redline, while supremely refined suspension systems front and rear help provide precise, responsive handling. Wrapped in aerodynamic and lightweight bodywork that's lifted from the racetrack, the GSX-R600 can not only win races, it can win envy. 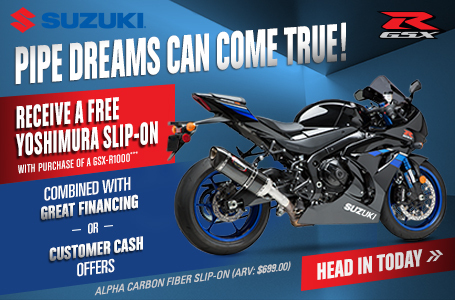 The GSX-R600's compact, fuel injected, 599cc, four-cylinder engine delivers a rush of power from idle to redline. Located between the frame's spars, the engine's top end is canted forward to improve cylinder head charging for increased power output. The Suzuki Drive Mode Selector (S-DMS) lets the rider adjust the engine's power delivery to suit the riding conditions. Camshafts with aggressive valve-lift profiles were developed using proven MotoGP racing engine technology - the first time this method has been applied to a production Suzuki. The frame is mated with a cast aluminum swingarm and multi-piece rear sub-frame that's ready for racetrack use. Stylized Suzuki “S" 3-D emblems on the fuel tank and the fork upper bracket denotes the quality, sophistication, and performance legacy of the brand.